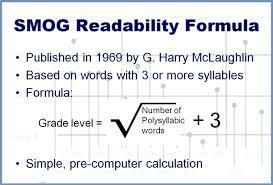 Readability Testing | Language Solutions Inc.
A readability test is used to calculate the grade level a person must have completed in order to understand written documents. 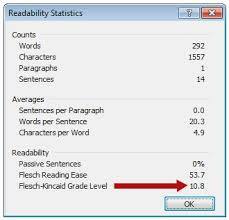 Readability tests measure only the structural difficulty (words and sentences) of written text. They do not measure other factors such as conceptual difficulty, organization of material, content, or reader characteristics. Even documents written at a low grade level (4th to 6th) may not follow Health Literacy guidelines. Our Health Literacy team can test your documents to see what grade level they are currently. Our writers can ensure that your documents are written at a specific grade level and that they follow Health Literacy guidelines. Research studies from many sources, including national literacy data, tell us that a large share of U.S. adults can only read at very basic levels. This problem is particularly striking among Medicaid beneficiaries. However, both Medicare and Medicaid require that healthcare communications be at a certain reading level. Most states have guidelines for materials to test below 6th grade. Currently, the Readability tests that are out there are for English language materials. The Fry Index does have one that can be adapted for Spanish. The number of difficult words in a sentence. Difficult words have 3 or more syllables. The length of sentences. Longer sentences will increase the grade level. https://www.cdc.gov/ccindex/index.html – The CDC Index is a research based tool to help you develop and assess public communication materials.